A pool of flaming gasoline spread across the garage floor, gushing out into the driveway. In the backyard, a blowtorch of propane sent firefighters scrambling. A “wall of fire” had engulfed the entire right side of the home. Any one of these could be expected at a fire, but all three combined seemed more like a scene from the movie “Backdraft”. Just after noon, firehouse speakers across the city crackled with an urgent message: multiple callers reporting a home “fully involved” by fire. Although fierce wind gusts, frigid temperatures, and a near-foot-deep blanket of snow had most people hiding indoors today, your New Rochelle Firefighters raced out into the blizzard. The address on the city’s northern frontier meant firefighters already hampered by the storm would be even further delayed. Some of the first – and most important – fire crews would likely take 10 to 15 minutes to arrive. Then, a stroke of luck. Usually the nearest firehouse is staffed by only three firefighters. Thankfully, this was not an ordinary day. During storms, more firefighters are sometimes __ to compensate for difficult conditions. Today, an extra fire engine and four firefighters were standing at the ready and arrived within minutes. 27 firefighters battled the fire, as well as the merciless conditions, for almost 4 hours. All occupants got themselves out safely, but several firefighters were injured. NEW ROCHELLE, N.Y. (CBSNewYork) – There were terrifying moments in the middle of the storm on Tuesday, as flames shot from the roof of a Westchester home. As CBS2’s Hazel Sanchez reported, investigators believe a snowblower may be to blame. Residents in the New Rochelle neighborhood were weathering the massive snowstorm. New Rochelle firefighters had their hands full with a house fire during the blizzard. You need the latest version of the Adobe Flash Player to view the video related to this article. Download Now. 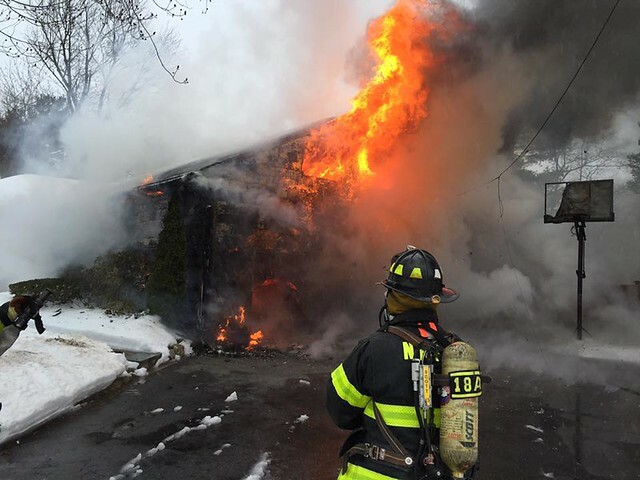 NEW ROCHELLE – New Rochelle firefighters had their hands full with a house fire during the blizzard. NEW ROCHELLE, NY — Two firefighters were injured early Tuesday afternoon, after a fire destroyed a single-family on Thornbury Road in the far north end of New Rochelle. One firefighter was injured when a ceiling collapsed on him. He was taken to White Plains Hospital. The other was treated on the scene. Your New Rochelle firefighters had a blast yesterday morning working with NBC New York on a special Daytona 500 segment. We had a great time with the cast, guest Dale Earnhardt Jr. and his lovely wife Amy Reimann, who were all super nice. Also, we have to give a special thanks to the crew; it was a pleasure working side-by-side with our brothers and sisters of IATSE LOCAL ONE and Nabet-CWA Local 11! Check out our Facebook photo album of our day on set. CLOSE New Rochelle firefighter Rich Bongiorni thought there was a mistake when he received a call from an NBC producer regarding a “Today” show segment that would feature race car driver Dale Earnhardt Jr. But it was no fluke. Bongiorni – like Earnhardt Jr. – has years of racing experience, though it’s not with motorized vehicles. NEW ROCHELLE – A fire spread from the basement to the top floor of a three-story building on Union Avenue after a boiler malfunctioned Thursday evening. Police said all eight apartments were destroyed, and at least 15 people, possibly more, were displaced. NEW ROCHELLE – A religious candle set fire to curtains early this morning, causing a fire that gutted a bedroom in a downtown apartment building and displaced five families. 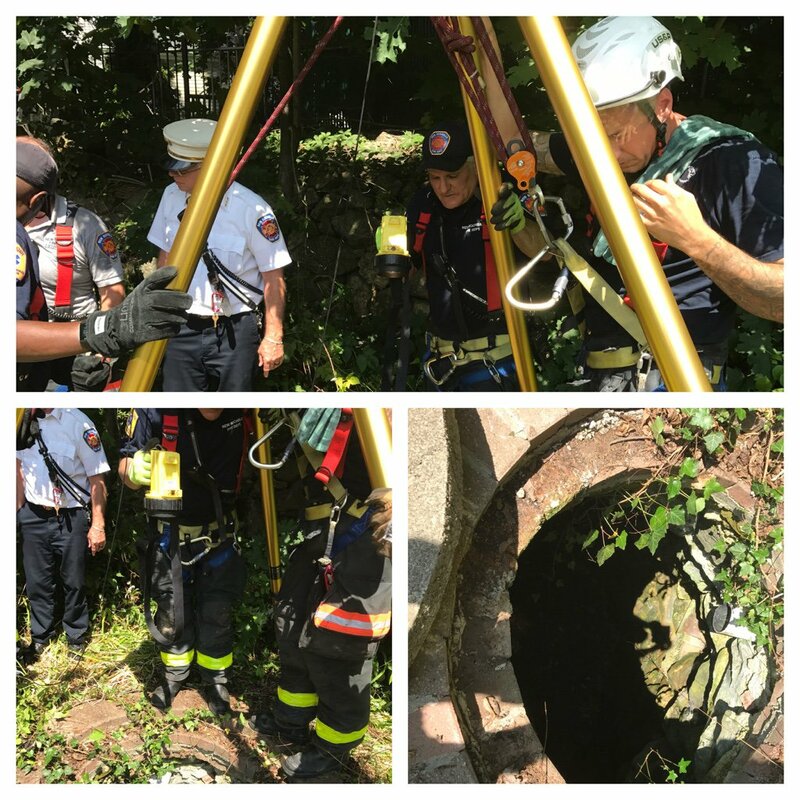 The apartment’s residents and one police officer were taken to Montefiore New Rochelle Hospital for treatment of smoke inhalation. More than 25 of your firefighters donned their dress uniforms Saturday and happily spent their day off marching through New Rochelle alongside our on-duty members and fire trucks. According to Lohud, spectators along North Ave and Main St. numbered in the thousands. The sidewalks certainly seemed packed in front of Spectators! Taking it to a new level this year, they even brought Mighty Mouse back to his home town after 75 years, along with several other floats. NEW ROCHELLE, N.Y. (CBSNewYork) – The Thanksgiving countdown is on, and while millions will watch the giant floats in the city there is another local parade. As CBS2’s Cindy Hsu explained, it’s all about the superheroes. Remember Mighty Mouse? NEW ROCHELLE – When a January fire ripped through an apartment with an elderly citizen trapped inside, firefighter Kevin Thomas and Lieutenant Brian O’Keefe made their way through the flames to save the unconscious man. 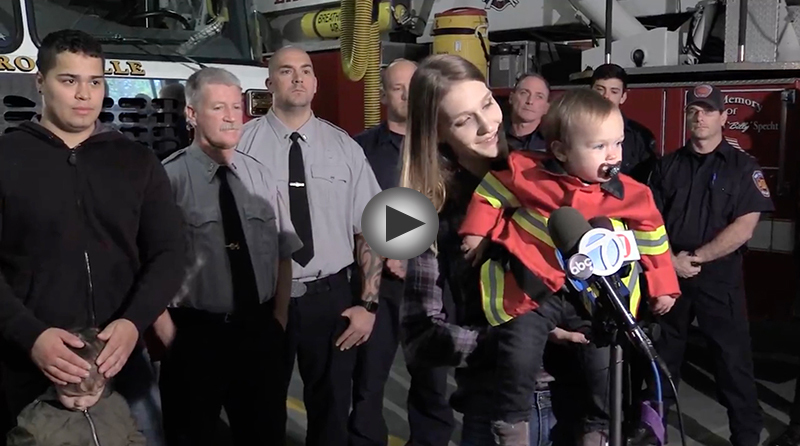 Thomas and O’Keefe were each honored for their courage Tuesday with Liberty Mutual’s Firemark Award for Heroism at New Rochelle’s Firehouse Station 1. “People trapped” – something no firefighter ever wants to hear on their radio. But just before midnight last night, that very message echoed through each of New Rochelle’s firehouses, launching crews into action. Tragically, one of those trapped did not survive, having been in a room that was already engulfed by fire as firefighters arrived. Luckily, other residents were able to escape by climbing down a tree in the yard, preventing further loss of life. Throughout the night, firefighters fought their way past intense flames only to be forced back out of the home again and again. Finally, in the early hours of morning, the fire was brought under control. Various collapsed areas, including much of the third floor, made operations inside the home slow and dangerous. 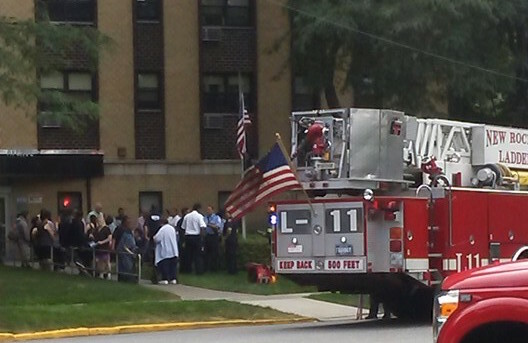 One firefighter was rushed to the hospital and many more were left exhausted and saddened by our lost resident. A body has been found after a third-alarm fire burned through a large house in New Rochelle overnight. Family members said one person, a woman, has not been located. Firefighters searched the collapsed home on Hamilton Avenue, where heavy flames broke out at around 11:45 p.m.
NEW ROCHELLE, N.Y. (CBSNewYork) – One person is missing and two others are hurt after a large fire rips through a home in New Rochelle. The fire broke out on Hamilton Avenue around 11:30 p.m. Sunday. The flames consumed the house for hours. A raging fire burned through a home in Westchester on Sunday night, sending firefighters scrambling to control the blaze, which injured two people, police said. The fire began sometime before 11:40 p.m. at a home on Hamilton Avenue in New Rochelle. The fire was still burning after 3 a.m., police said. VIDEO: NEW ROCHELLE FATAL HOUSE FIRE Video: New Rochelle house heavily damaged in fire | 1:03 A devastating fire ripped through a historic New Rochelle home overnight. The blaze began just before midnight on July 17, 2016. Matt Spillane/The Journal News VIDEO: NEW ROCHELLE FATAL HOUSE FIRE VIDEO: New Rochelle house fire | 0:44 Firefighters battle a fire at 10 Hamilton Ave.
A 55-year-old woman is dead after a fast-moving fire ripped through a New Rochelle home overnight Monday. When the first fire trucks pulled up to 50 Sickles Avenue this afternoon, the front yard was filled with escaped occupants reporting smoke in the building. At first, the sixth floor hallway was relatively clear, but as soon as firefighters forced open the apartment door, heavy smoke began pouring out from floor to ceiling. After a brief search, crews found a kitchen fire that was just beginning to spread into the next room, and quickly stopped it in its tracks. At 9 stories, 50 Sickles Ave is considered a high-rise, presenting unique firefighting challenges. For example, fires on upper floors are out of the reach of fire department ladders complicating rescue. Luckily, everything went well today!